You know how studies have been telling us lately that blueberries, raspberries, acai berries, and the like are fantastic for our health? Stuffed full of antioxidants and beneficial phytochemicals, all these berries have proven to be nutritional powerhouses that help us in a myriad of ways, including boosting the immune system and protecting the heart. Sea buckthorn berries, as it turns out, have similar super powers. One of the most scientifically studied berries out there, it has potential in many areas of health and wellness, and has exploded on the market as a great ingredient for use in skin care products. These luscious looking little berries can do wonders for your skin! Also called the sea berry, sandthorn, and sallowthorn, sea buckthorn (Hippophae Rhamnoides) is a deciduous shrub native to Europe and Asia. It can grow up to 19 feet high by 8 feet wide, with dense and stiff branches full of thorns. (Think blackberry and raspberry bushes—the same idea.) The leaves, however, unlike other berry bushes, are a silvery-green, long, and slender. Male plants produce flowers, which create the pollen, while female bushes produce the orange berry-like fruit. According to Greek legend, the ancient Greeks used sea buckthorn leaf in a diet for racehorses, and that's where it got its botanical name—Hippophae, which means “shiny horse.” The medicinal use of the plant and its fruit goes back just as far, with references found in Ancient Greek texts and in classic Tibetan medicinal texts dated to 618-907 A.D. Herbal remedies obtained from the plant were originally used to treat skin diseases and digestive issues. Various parts of the plant and its fruits were also traditionally used to lower fever, reduce internal inflammation, and treat colds and coughs. The Russians are often credited with being one of the first to harness the potential of sea buckthorn for medicine. In the 1970s, the Chinese started experimenting with using sea buckthorn as a drug, listing it in 1977 in the Chinese pharmacopoeia. Traditional uses in the Chinese culture date back much further than that, however, when use of sea buckthorn was recorded in texts from the Tang Dynasty. From 1985 to 1993, Chinese scientists conducted experiments on the juice, oil, and other extracts, and found that sea buckthorn contained all sorts of goodies, including vitamins, trace elements, amino acids, beta-carotene, zeaxanthin, lycopene, flavonoids, fatty acids, tannin acid, and more. Today we know that sea buckthorn is a great source of vitamin C, carotene, vitamin E, malic & succini acids, amino acids, natural oils, and other bioactive compounds. Modern research has indicated components from the plant and berries may help encourage weight loss, increase the benefits of exercise, prevent liver fibrosis, and benefit cardiovascular health. Great for oily skin. Sea buckthorn helps with oily skin and those prone to clogged pores. Fatty acids. Super source of rare fatty acid—sea buckthorn is considered the most abundant source of the rare omega-7 essential fatty acid, which can keep your skin looking firm and lifted. Sea buckthorn is also a source of omega-3, -6, and -9 fatty acids. Talk about a superfood for the skin! Antioxidants. These help protect the skin from environmental stressors. Hydrating. All those fatty acids and natural oils help keep skin hydrated, avoiding dryness. Natural source of vitamin C. Have you seen all those vitamin C products out there? They help provide antioxidant protection. Sea buckthorn is a super source of vitamin C, which means it can help reduce the appearance of wrinkles and even skin tone. 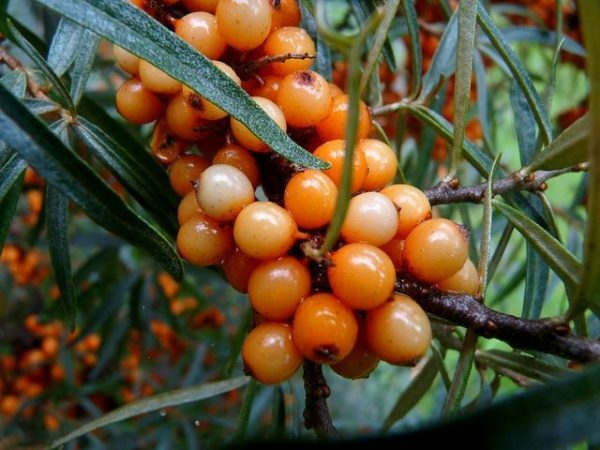 Have you tried sea buckthorn in your skin care? What did you think? Photo courtesy Sue Wolfe via Flickr.com.